I personally feel that Android needs a strong, unified syncing solution that harmonizes your desktop computer with your smartphone and tablet. Apple has got this nailed with iTunes and iCloud but Android is severely lacking in this department; users have to install a bunch of different apps that sync different kinds of files: you have Dropbox for photos/videos, Google Docs for documents, doubletwist’s excellent AirSync app or Google Music for your music library etc. etc. Android enthusiasts tend to see this as a plus on Android’s part but I don’t. On iOS, photos/videos/documents that are edited on one device show up on the others. It’s seamless. It’s wireless. It’s beautiful. On Android, you have to do this stuff manually. Dropbox does an excellent job of syncing photos/videos, but it isn’t very elegant when it comes to file transfers. We came across a very simple and straightforward solution for transferring files between PC and phone. It’s called EZ Drop and you can check it out after the jump! Transfer files from your computer to your phone without a cord. No log-in required, free and fast. We’ve tested the app on a Samsung Galaxy S II on Android 2.3 Gingerbread and can confirm that it works somewhat as advertised. The part about it being a “free and fast” solution is true but it isn’t a file-syncing solution as its name in Android Market may imply (it’s called EZ Drop (File Sync)). 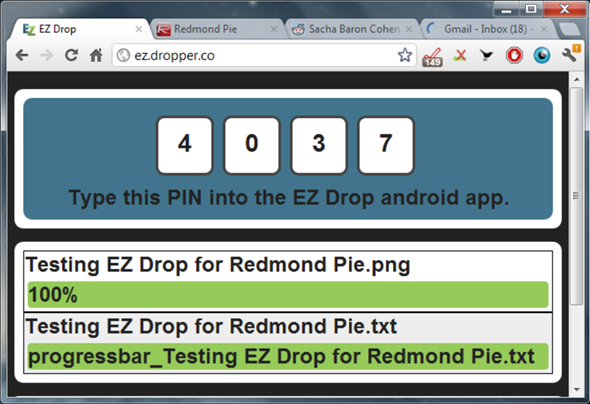 When you launch the app, it asks you to enter a PIN code which you can get this PIN code by going to ez.dropper.co. Once you have entered PIN code on your smartphone, you can send files to your smartphone using a simple uploader. 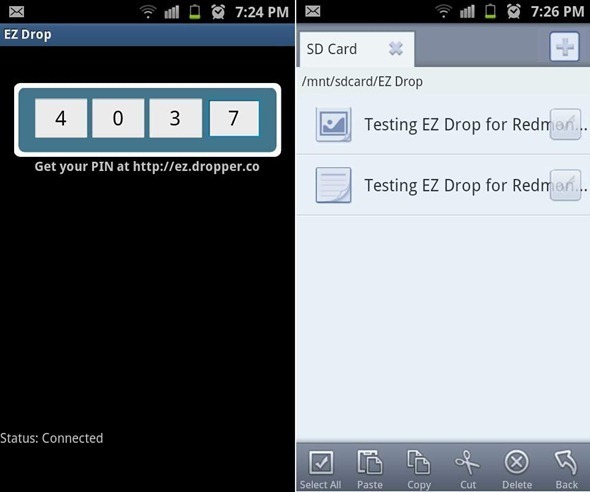 This file is uploaded to EZ Drop’s servers and then downloaded to /sdcard/EZ Drop on your smartphone. That’s just about it. EZ Drop is a one-trick pony that does its trick well. So yes, EZ Drop is a dead simple file transferring solution that will come handy when you just need to send a file to your phone from your PC. It is available for free and can be downloaded from the link embedded below.